When it comes to moving, there are a lot of things to think about before the big day. Of course, you’ll need to make sure all of your belongings are packed tightly and securely and ready for the move. But, you should also be thinking about what you’re going to do with your pets. Moving can be a confusing time for pets, and they’ll either want to play and be curious about everything going on, or they’ll want to hide. Neither situation is good for you or your pet, so it’s important to prepare beforehand. If you’re not sure how to prepare for your beloved critter, then you’ve come to the right place. In this article, we’re discussing moving with pets and things you can do to make it easier on all of you. Keep reading to learn more. The closer you get to moving day, it might be a good idea to take your pet to a boarding facility or a family friend that can watch your pet for a few days. This will help to keep them out of the way and alleviate some confusion and anxiety for them. This will also prevent your pet from hiding so that you can easily grab them when it’s time to go. If you decide not to take your pet away to a pet sitter, it’s still important to keep them out of the way of boxes, furniture, and other things that will be moving around. It’s also safer for you so that your pet doesn’t get under your feet and trip you while you’re getting around. Consider locking your pets in a bedroom while you move the rest of your things. This will also prevent them from escaping to hide. Make sure to pack an overnight kit for at least the first few days when you arrive at your new location. You’ll need water, food, snacks, and toys to help your pet get more comfortable with the surroundings. Packing a separate overnight kit will help prevent you from losing things that your pet needs. If your pet takes any medications, make sure to include these in your kit. Moving with pets can be tedious. Some pets don’t like riding in the car. But, it’s important that you transport your pets using your own vehicle if possible. They will be familiar with your scent and feel more comfortable traveling with you instead of a stranger. Also, make sure to crate your pets in the car for safety. When you finally arrive at your new home, it’s important to be cautious when first introducing your pet to the surroundings. A useful tip is to set up a room for your pet first to limit the amount of exposure your pet gets to its new home. Quickly re-introduce previous routines including feeding and play schedules. Make sure to spend lots of time with your pet to reassure him in his new surroundings. 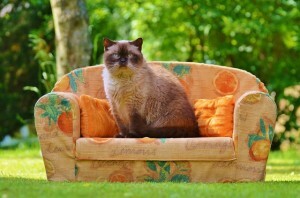 Moving with pets doesn’t have to be overwhelming and stressful. In fact, the more stressed out you are, the more stressed your pet will be. Try to take it easy and simply follow these tips the next time you find yourself moving with pets in tow. It’s a good idea to contact a local veterinarian in your new neighborhood soon after you move in. You should also consider having your pet micro-chipped and make sure they wear a tag, especially if they frequently go outdoors. And, don’t forget to contact your old vet where you’re moving away from to obtain your pet’s medical records. When moving day gets closer, and you need professional help, or if you have questions, feel free to contact us. We offer a wide range of services to help your move go smoothly. "Your team was really great. We want to compliment you on your moving staff. They were always professional and helpful."